← BMP Coops & Watershed Groups: A Solution to the Stormwater Maintenance Dilemma? Exposed Soil = Pollution: A Better Way to Get the Construction Site Dirt Out. The Big Six are the pollution sources degrading most waters and include: construction sites, post-construction stormwater BMPs, existing stormwater BMPs, point source discharges, pastures and cropland. The presentation shows how to quickly determine if each source is being properly managed in your watershed. The other two presentations describe how to win improvements to the two largest pollution sources in many watersheds: construction site sediment pollution and poorly maintained stormwater BMPs. 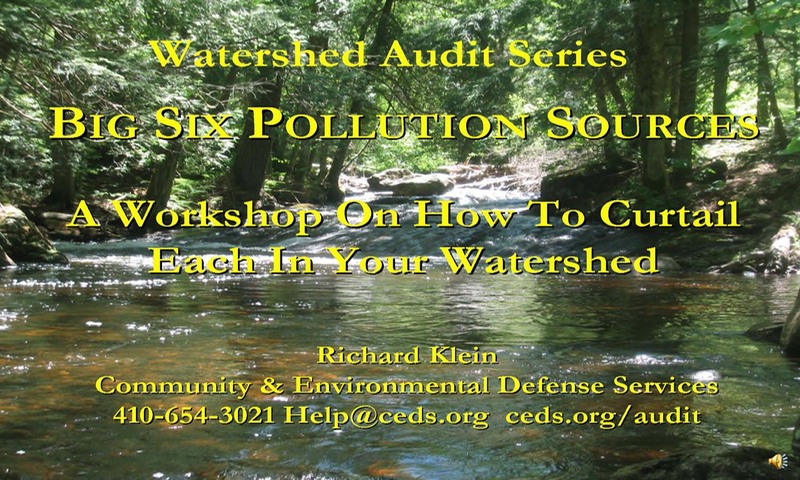 These presentations plus free supporting documents provide even novice watershed advocates with the ability to spot pollution then win quick correction. Bringing existing pollution sources into compliance with clean water laws is generally the quickest, most cost-effective way of improving water quality. You don’t need lawyers, an engineering degree or any other special training to begin making your favorite waterway better. The presentations and guidance documents provide all the information you’ll need. Expanding the Number of Watershed Residents & Visitors Who Support Your Efforts. Generally we ask a minimum fee of $25 per person with a registration of at least 20 people per workshop. For further detail on these workshop topics or to schedule one for your area, go to: Workshops. Past efforts to improve compliance with sediment, stormwater, and other clean water laws has asked volunteers to spend considerable time learning how pollution control measures work, then contact an enforcement agency when problems were found. Not surprisingly few volunteers had the time and fewer still were comfortable confronting enforcement agencies. Our new approach allows one to identify jurisdictions achieving a low level of compliance then provide them with the public support needed to make improvements. Additionally, we’ve developed a way to win the cooperation of development companies and other responsible parties (responsible for controlling pollution from their property) that can achieve compliance very quickly without involving an enforcement agency. With regard to agriculture, where pollution controls are implemented voluntarily, we urge watershed advocates to publicly thank those farm owners who are using cover crops, stream buffers, and other Best Management Practices. This public acknowledgement then sends a message throughout a watershed which prompts other farm owners to implement similar practices. Combined, these approaches can bring about dramatic improvements in water quality through the efforts of a few dedicated volunteers or staff. The successes are won not with lawyers and threats but by something more akin to neighbors helping neighbors. And while these interactions can be tense at first we’ve found they quickly settle into to something more like cooperation. But as you’ll see in the next section of this article, you can help without taking any direct action. So, please try out one of our YouTube presentations then apply the knowledge to a site or two as you are out on shopping errands, commuting to school or work, etc. Give us a call (410-654-3021) if you have any questions or you’d like to share a success. Watershed Advocates Stormwater BMP Database. Our goal is to eventually have sufficient information so the Chesapeake Bay watershed advocacy community can identify jurisdictions that are achieving an unusually high level of compliance as well as those not doing so well. By learning what the high-achievers are doing right we can help others to accomplish the same. When we a find a jurisdiction achieving a low-level of success the Chesapeake Bay watershed advocacy community can then provide the additional public support needed by the jurisdiction to improve compliance. So if you do nothing else but use the presentations to evaluate sites and report your findings via the online databases you can make a significant contribution to a healthier Chesapeake Bay and your local waterways.